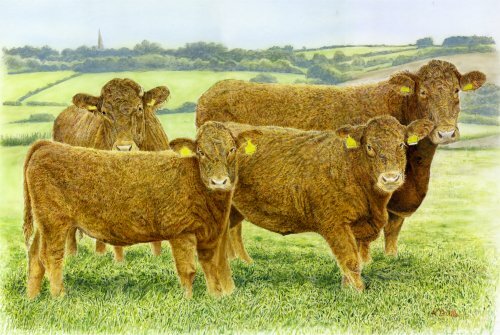 At this time of year farmers are very busy in delivering lambs and calves on their farms and it was no surprise that I had great trouble contacting one farmer to inform him that his painting of South Devon cows and calves was ready. The painting 18 x 12 inches features Fidget, Gladys, Pride and Lora happily grazing. These are part of a 400 plus herd each with their own name and character which the farmer was happy to describe. The painting was well received and will bring many years of enjoyment for the whole family.